“I just need one whole squid.” To his credit, the fishmonger did not bat an eye. Even better, he gave it to me free of charge. Wise words from a wise man. Likewise when he compared Ray Comfort to an incompetent sphincter. The squid is in the freezer with Spike the water monitor. I think I’ll name it PZ Jr.
Ussher…He’s the one with the band-aid right? While most of us were presumably present at the moment of our own birth, few can honestly say they can clearly recall it. Even fewer had a good sense of the exact hour or day when this singularly important event took place, at least at the time. While we tend to take knowledge of our own birthdate for granted (mine’s November 1 by the way, I know you’ve all been trolling my Amazon wishlist), we of course depend upon the memory of other interested parties, namely our parents. Dial back several centuries or so, and most humans had only a very hazy idea of when the were born perhaps narrowed down to a particular season of a given year. 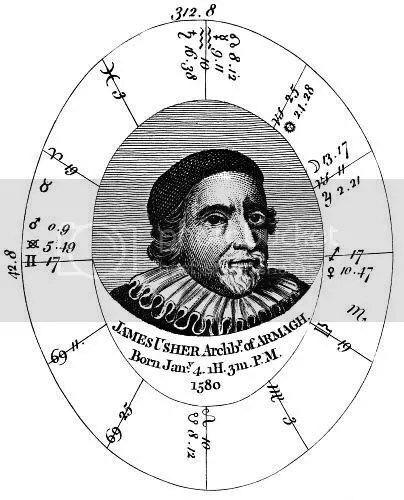 High-born Europeans, like James Ussher, were better off than most, and we might assume that his literate clerk father is responsible for the unusually exact record we have for Ussher’s birth (see image above). As Primate of All Ireland, Ussher took it upon himself to calculate the exact birthdate of the Earth using the best documentary accounts of his time. After considerable scholarly investigation Ussher deduced that the planet was created around nightfall on October 22nd, 4004 BCE. Hearty chortles across the interweb today in response to the WorldNetDaily piece commemorating the 6010th [sic] birthday of the planet. Anyone adhering to Ussher’s chronology in 2007 deserves a chortle. However, it’s important to remember that Ussher himself was working in 1658 well before Jim Hutton, Chas Lyell, or Chuck D. In building his chronology Ussher attempted to integrate historical records from different cultures across the “Middle East” (what’s the PC term for the fertile crescent anyway? ), or what WorldNetDaily hilariously calls “secular sources.” All hail secular Marduk! Uh, anyway…go read Steve Gould’s classic “Fall in the House of Ussher” for an excellent account of how the Irish Primate should be a hero for modern academics and not reality-challenged young earthers. Well I just don’t know what to think. 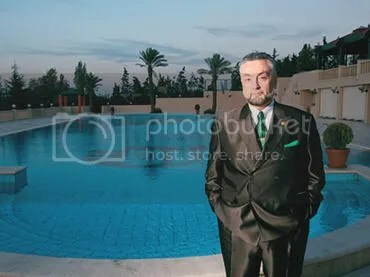 First, Adnan Oktar aka Harun Yahya aka Assisted Living Dracula sends me a FREE copy of his beautiful 700 page full color magnum opus Atlas of Creation, vol. 1. But then, he gets my website banned in Turkey along with the rest of WordPress.com! Which is it Adnan, are we hermanos or what? An Inordinate Fondness, or Can’t We All Just Get Along? Male Convergent Ladybird Beetle (Hippodamia convergens) getting frisky with a mating pair of Asian/Harlequin Ladybirds (Harmonia axyridis). I’m glad you wrote a letter. Good for you! You can write, but did you read anything I wrote? And? Just for the record, once again, I specifically said, at my blog, that I did not believe this particular revision in the evolutionary doctrine was going to prove anything for Christianity or Creation. Please, please I wish you all would stop suggesting that I said otherwise. 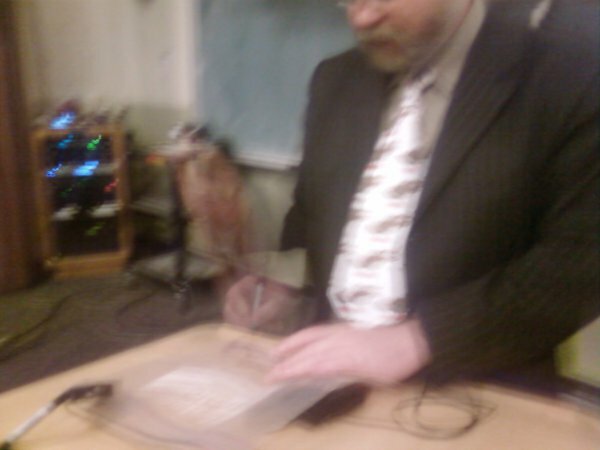 I was perfectly content to post the article, make a comment or two, and let people draw their own conclusions until Brian linked back to my blog with his smart title, condescending remarks, and until many other started posting their ’science’ at my blog. But at my blog, I can defend it my way. I do wish you would stop mischaracterizing my blog entry. Thanks for all the fun. I leave you all with your rocks, bones, theories, charts, graphs, and unbelief. If I ever want to know about beetles (!) or water or trees or mars or ’science’, I’ll get back with you. If any of you ever need or want to know about Christ, well…you know where my blog is! Happy trails! I guess that that too is meant as a burn, although I’m not sure what’s so uninteresting/irrelevant about water, trees or Mars (or bones and graphs for that matter). As far as beetles go, as J. B. S. Haldane observed, and Carel has recently reminded us (complete with his stunning beetle vanitas), a fondness for beetles would appear to put me in good company. I am glad that He cranked down the oxygen though, but more on that later. 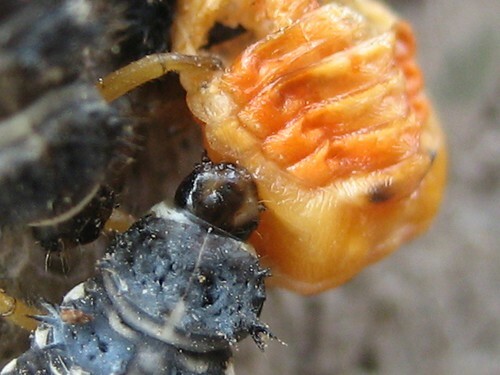 Larval Asian/Harlequin Ladybirds (Harmonia axyridis) cannibalize a pupa of the same. So goes the theory of pterosaurian mega-skimmers according to a new PLOS paper by Humphries et al. 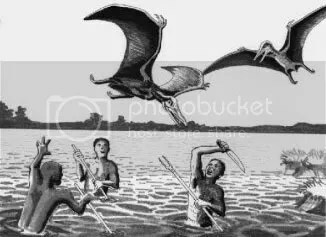 The researchers, including Flickr pterosaur maven Mark Witton, employed the bane of all arm-waving theories, math, to model the energy costs of a large flying pterosaur dipping it’s jaws into the surf to scoop up fish. At least one group of extant birds, the aptly named Skimmers, engages in this behavior. Perceived skeletal similarities (mostly a long, tapered ‘bill’) had led some to infer this style of feeding in pterosaurs. The authors conclude that the drag incurred by such a behavior would have rendered it a near-impossibility, at least among the large pterosaurs that have been most commonly depicted skimming. The researchers also compared the skulls of pterosaurs with living Skimmers and found the former lacking many of the morphological specializations that would be expected in organisms adapted to skimming. Once again, PLoS = totally awesome (see, I can use math too!) Much more at Laelaps, if we’re lucky, Darren might weigh in too. Above image questionably sourced from this questionable source. Mark Witton’s awesome illustration and a personal account is here. A summary by Liza Gross, PLoS is here.